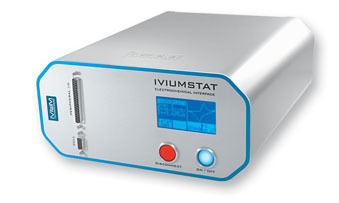 The IviumStat is well suited for applications requiring a wide dynamic range, such as battery testing, corrosion measurements and electrochemical research applications. It has a high power of ±5A and low current ranges, down to 1pA full scale. The IviumStat offers a complete package, all the standard Electrochemical techniques are included. The IviumStat also has an integrated high-performance Frequency Response Analyser for EIS measurements from 10µHz to 8MHz. All measurement and dataprocessing software is included (for Windows based pc’s).